Need a new power bank? Or one that’ll last you on a long journey or weekend trip? Well you should put the Aukey Power Bank 20000mAh on your list of considerations. If you’re one of those people that’s likely to forget to bring the power bank charging cable or even worse lose it, don’t worry you can charge up this Aukey portable charger with your iPhone lighting cable! As we all know with electronics many things can go wrong causing it to malfunction. However, with Aukey, for peace of mind you’re covered by their 24 month warranty and can register your product on the Aukey Website. 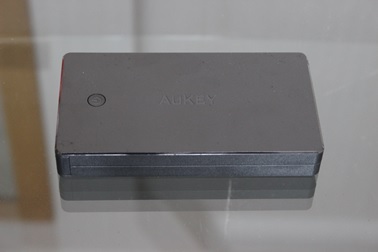 To find out more, continue reading our Aukey Power Bank 20000mAh review below! As an indication of how much power it holds you can fully charge your iPhone 7 Plus 4.5 times. 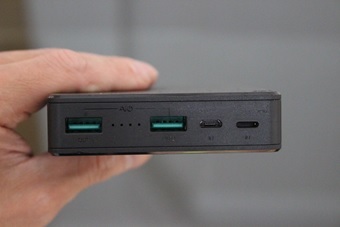 Dual USB ports which both have a fast 2.4A output speed. Conveniently use an Apple lighting cable or Aukey’s micro USB cable to recharge the power bank. Your devices will gain the safest maximum charging speeds with AiPower technology. Gain protection against your devices overheating, overcharging and excessive current with built-in safeguards. The carry pouch included has a separate outside compartment which can be used to store loose items such as: Cables, USB sticks, SD cards, earphones, etc. Comes with a 24 month manufacturer’s warranty. Able to charge devices from both ports at high speeds of up to 2.4A per port. Many power banks with dual ports will have one port with a lower output, but the Aukey Power Bank charges devices quickly from both ports. Charge your devices at the optimal speed as AiPower will detect the safest maximum speed at which to charge your devices at. If you lose or forget the USB charging cable, you can still charge the Aukey portable charger with an iPhone lighting cable. No built-in flash light which can be handy to see or find things in the dark. Still quite big and bulky, not small enough to fit in your pocket. If you’re in need of a high capacity power bank for a trip away or to power up multiple devices if you’re out for the day, then the Aukey 20000mAh power bank should do the trick. The absence of a built-in flashlight shouldn’t be a deal breaker, but what could be is the large size. Despite being slimmer and lighter than iMuto Taurus X4 Portable Charger which has the same size capacity, the Aukey portable charger is still slightly longer and wider. However, the charging speeds for both of the USB ports on the Aukey are quicker than the iMuto, so if you need power quickly, Aukey is the way to go! 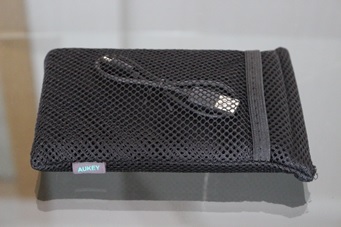 Another little cool addition to the Aukey 20000mAh portable charger, is the carry case it comes with. This case has a little front pouch where it can be very useful for storing smaller items such as: Cables, earphones, SD cards, etc.